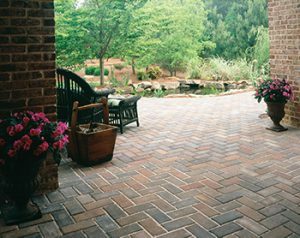 When you are getting your landscape designed, you’ll want to create spaces that you will not only love to use, but that will add value to your property. This is why you’ve probably spent so much time looking for the best landscape designers in the area and browsing the internet for the latest backyard design trends. Whether you are going for a bold and luxurious yard or a quaint New England garden, installing a water feature is a great way to create a unique zone on your property. Ivy Studio has been catering to our customer’s water feature needs and wants for many years now and with great success. We have extremely creative and skilled landscape designers on our team that can design water features that will complement the overall appearance of your landscape. These are a very popular elements that can be made of materials such as metal, concrete or natural stone. In most cases, a stunning fountain installed in your yard or garden can be quite an eye catcher and adds a focal point to the outdoor space. In fact, there are times when we have designed entire landscapes around a custom-designed fountain. A custom rock waterfall design looks impressive in any landscape. The sound of the cascading water can be extremely calming and refreshing all at once. We can create waterfalls of any size and design so you can decide whether you want one with or without a pond. The latter provides a safety factor and is excellent for homes that have kids and pets. In fact, these are also space saving features that can be added to enhance your deck or patio design. Many homeowners also like to have ponds installed in their backyard. We can create the kind of pond design you’ve always dreamed of, meaning you can decide what you like these features to look like. In fact, our landscape designers will discuss your requirements with you and focus on creating solutions that are right for your ideas and vision. If you want a pond that has a Zen design, a Koi pond is a great addition to your property. You can add aquatic plants to this pond as well. The other themes that are used to design ponds are tropical, Mediterranean, etc. We can also add LED underwater lights to create a stunning display of light and water. We use high-grade materials in our work and have extremely skilled and experienced craftsmen on our team that ensure you get the best landscape solutions that fit your budget. Regardless of whether you want us to do a complete redesign of your backyard or just want a fountain or waterfall installed in your backyard, we at Ivy Studio can help. Get started on your landscape design project today to have a beautiful custom backyard waterfall designed and installed, or take a look at our other landscape design services we offer to the greater Boston and Massachusetts Bay area.